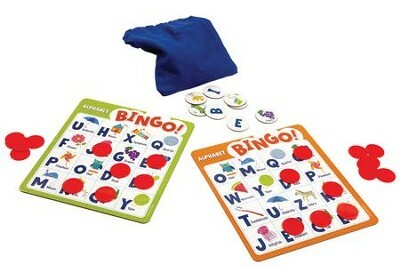 Practice your ABC's while you play with Alphabet Bingo from Peaceable Kingdom. Designed for ages 4 years and older, this game is a twist on the classic---reach into the bag and pull out a letter token, if you have a match, you are on your way to B-I-N-G-O! A great learning game for kids to practice letter recognition, uppercase letters, and letter/object association. For 2 to 6 players. Includes: 6 game boards, 26 alphabet tokens, 72 chips, 1 game bag, and instructions for multiple ways to play. I'm the author/artist and I want to review Alphabet Bingo Game.